This is an American dessert that dates back to Colonial American times. 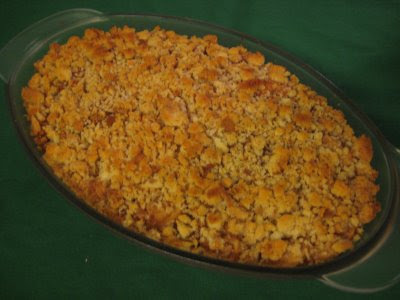 A ‘betty’ is a baked fruit pudding, made with layers of sweetened and spiced fruit and buttered bread crumbs. Similar to a crisp or a crumble, it's one of those desserts that I like to call a "throw-together" dessert and it's so rustic and simple, anyone can make it! Grease a 2-quart casserole. Set aside. Place bread crumbs in a medium bowl. Pour melted butter over the crumbs and toss gently until well combined. In another bowl toss together apples, brown sugar, cinnamon, and lemon juice. Layer 1/3 of bread crumbs in prepared casserole, then 1/2 of the apple mixture. Repeat layers, ending with bread crumbs. Sprinkle top with a little extra cinnamon. *To make bread crumbs- Take 5 or 6 pieces of regular white sandwich bread, and break them into pieces. Place them in a food processor and pulse it approximately 12 times until it becomes coarse crumbs. If your apples aren't quite as juicy as you'd like, go ahead and add a few tablespoons of water along with the lemon juice. If you don't have any lemons, try a splash of orange juice instead! Instead of serving it with ice cream, try a little drizzle of heavy cream over the top, or a big dollop of sweetened whipped cream. For an even bigger splurge, serve it with a little hot caramel sauce!